"I love candy corn" - no one ever. Fall is a wonderful time full of crisp breezes, pumpkin spice lattes, and a whole lot of free candy. But there is something lurking under the surface that has threatened to ruin the majesty of fall for children and adults everywhere since 1898. It now comes in all shapes and sizes, hides beneath the chocolate in the candy buckets, and catches you off guard with sneaky packaging. 1. It sits on a throne of lies. Raise your hand if you’ve felt personally victimized by candy corn. Is it corn? Is it candy? NO. It is neither, not by a long shot. It’s not fooling anyone, so why does it feel the need to so blatantly deceive us? It does not look, taste, smell, or act like corn. It most definitely cannot be considered candy because candy is meant to taste good. I’m sorry if you’ve been tricked, but this benign-looking confection is living a lie. 2. Snickers satisfies, candy corn does not. When you eat candy corn, you are literally eating nothing. It has no protein like snickers, no caffeine like chocolate, no calcium like milk duds. There’s no way it can sustain you throughout a full night of trick-or-treating. #Useless. There are 5 ingredients in candy corn: sugar, corn syrup, carnauba wax, artificial coloring and binders. I rest my case. 4. Chalk is for sidewalks, not for eating. Okay, and what is with the texture? Is it chalky or chewy or waxy or mushy? I don’t know, but I know it’s certifiably horrible and most definitely not a texture of something that should be eaten. 5. It is disappointment wrapped in apathy and sealed with self-loathing. What kind of terrible person gives out candy corn on Halloween? The worst kind, that’s who. Because it often comes unwrapped, it’s exactly the type of candy your parents always warned you to not take on Halloween (kinda like candy apples laced with cyanid). Who knows what could be in it or who could have touched it along the way? It’s both unsanitary and unsafe. Not to mention a disappointment to children everywhere. 6. It tastes SO bad. If for no other reason, candy corn is the worst because it tastes the worst. 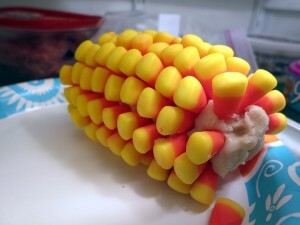 And if you’re into eating disgustingly sweet tricolored candles, then I urge you to please do us all a favor and fill your trick-or-treat bags with them this year so all the good candy will be saved for those of us who know the truth about candy corn… that it’s the worst “candy” of them all.